What is the one accent piece that’s a must on your Paris packing list? For evenings in the City of Light, there is nothing more chic and fun to add to your look than les paillettes (sequins). 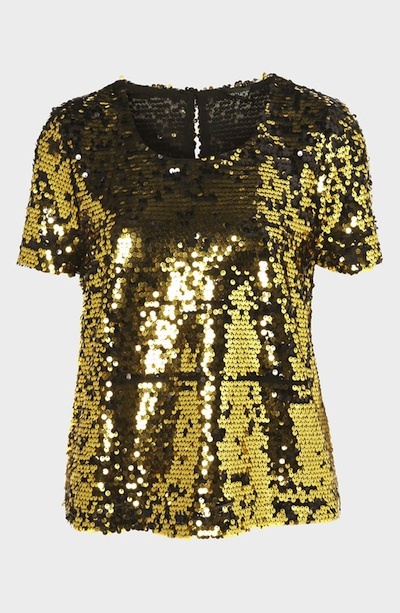 This Topshop for Nordstrom sequin top in gold and noir adds such a glamorous pop of shine and sparkle to any evening occasion, whether you’re going to a dinner with friends, to a sophisticated cocktail soirée, or to clubs and discothèques to dance the night away. With sequins fastened at opposing angles, you’ll light up the night in l’ensemble le plus scintillant du soir!